ENERGY EFFICIENCY COALITION: How big do you think turbines will be by 2020? How big do you think turbines will be by 2020? How has the average turbine size changed over the last decade? Ten years ago the average size was around 1.5 MW, today it is close to 3 MW. Thus the average size of onshore wind turbines more or less doubled. For offshore wind this is more difficult to say. A decade ago there were only very few turbines installed offshore. The average size could be assumed to be around 1.5 MW. Today the average offshore turbine size is below 5 MW, however 7 MW turbines and bigger are under development. The average size of offshore turbines has roughly tripled within a decade. In 2020 the average onshore turbine will be 4 MW. The average offshore turbine will be in the range of 12 MW. What are the pros and cons of bigger turbines? 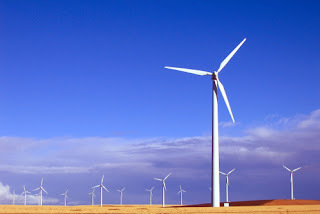 This is difficult to answer as there are many pros and cons for all existing types of turbines, sizes and concepts and the answer is very much depending on the site, its conditions and the strategy of the project as well as availability of components and turbines, not to mention pricing, capital and operational expenditure. And how about smaller turbines? If we are talking about smaller turbines, the benefits are easier ways of installation, availability of these products, building permissions (depending on the market) etc. However the capacity factors are limiting. What are you hoping to get out of EWEA 2012? Besides all the networking opportunities we will learn about the history in wind turbine development and challenges of the past, delegates will understand the actual challenges and needs in turbine design of the present as well as take home solutions to face these and last but not least all of us will look into the future and foresee the forthcoming turbine technology.